All wetlands, even those without open water, are protected under state law. 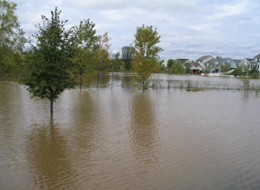 Impacts to wetlands, including draining, filling, or excavation need approval or permits on the local, state and federal levels. 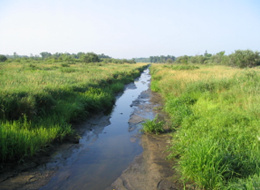 Wetlands, sometimes known are marshes or bogs, are areas where water covers the soil, or is present either at or near the surface of the soil all year or for varying periods of time during the year, including during the growing season. They support both aquatic and terrestrial wildlife, and are are most common on floodplains along rivers and streams, along the margins of lakes and ponds, and in other low-lying areas. Will you recognize a wetland when you see one? When identifying wetlands, agencies and private consultants use the scientific protocol in the Corps of Engineers 1987 Manual for Delineating Jurisdictional Wetlands. But, for the average landowner, there are some basic clues that may indicate that a wetland exists and that a closer look is needed. If your site looks like the ones below you may have a wetland. And if you have a wetland, a permit will be needed. 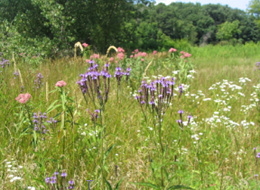 Click on the images below to learn more about wetlands and how to identify them. Descriptions of each image appear when the mouse is positioned over the image.